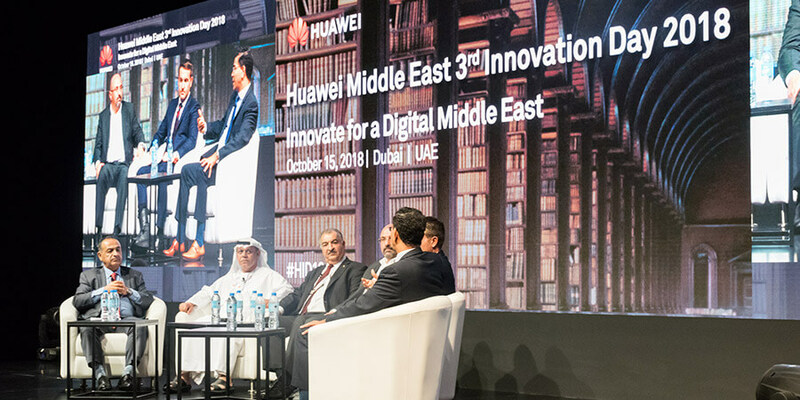 Huawei, a leading global provider of information and communications technology (ICT) infrastructure and smart devices, hosted the 5G Ecosystem Conference on the sidelines of the 3rd annual Middle East Innovation Day. Under the theme "5G is Now, Sailing to New eMBB Horizons," the conference promoted a 5G Ecosystem in the Middle East by bringing together operators, regulatory agencies, industry leaders and other stakeholders to discuss 5G from a business, policy, and industry perspective. During the event, Huawei organized live trials of the most cutting-edge 5G uses cases. These included drone taxis, a Virtual Room (VR) showroom, and tele-operated driving. Huawei also signed Memorandums of Understanding (MoU), with key partners to strengthen the 5G Ecosystem, including with Media Pro, Orange Business Service, and TPCast. Certificates were awarded to Internet of Things (IoT) organizations who have demonstrated outstanding value in the field of IoT. To wrap up the day, Huawei launched its own AI full-stack all-scenario solution. An Jian, President of Carrier Network Business Group, Huawei Middle East, said: "An open, collaborative, and sustainable ecosystem will enable and accelerate digital transformation for all industries in ME Region. We form and engage in open enablement platforms and business alliances that revolve around ME 5G Needs. We work together with ecosystem partners on open innovation projects to speed up the development of customized solutions, helping the governments of ME regions to consolidate their strengths in digital transformation and succeed in their national targets pursuits. Huawei will stay committed to openness, collaboration, and shared success." "5G's impact will be far-reaching, profiting not only operators but also enterprises, consumers, and society through digital transformation. Investing in 5G is thus an economic and social imperative. Today's 5G Ecosystem Conference is part of our effort to map out the industry blueprint for a fully connected, intelligent world driven by ICT. Our goal at Huawei is to provide strategic insight – and foresight – to our partners in both the public and private sectors, so that together we can navigate the Digital Transformation journey seamlessly, in an integrated and profitable manner. As a major telecommunication solutions supplier, Huawei has setup strategic partnership in 5G areas with carriers, and signed six 5G commercial contracts in the Middle East out of 18 globally. In 2018, Huawei has formed a series of strategic partnerships with telecommunication operators in Kuwait, and has accomplished some significant 5G progress in the country", An continued. Given 5G's wide-ranging applicability, the Whitepaper makes the case that a digital, sliceable platform is critical to 5G success, as it offers agility and adaptability. Flexibility to address new use cases, even unforeseen ones, as they emerge, quickly and cost-effectively, is critical to commercial success in the 5G era. In line with this necessity, the paper advises regulators to promote policy neutrality and open spectrum to accelerate commercial deployment. In addition, a panel discussion titled "Promoting the growth of 5G Industry and Ecosystem in ME" took place at the conference. The panel discussed about the acceleration of the release of new spectrums for 5G deployment, the current regional 5G policies, the advantages of forming a 5G ecosystem, and the role of carriers in 5G enabling vertical industries.